August 2013 | To Be, To Be. Tutubi. 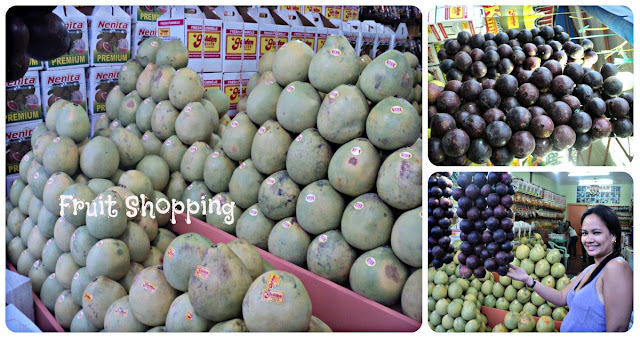 A visit to Davao wont be complete without some fruit shopping. And in case you are wondering, a separate blog post will be dedicated to the fruit Davao is most know for: Durian. After our Samal Adventure, we went to the hotel to drop off our things and then went out again to look for a place to have dinner. 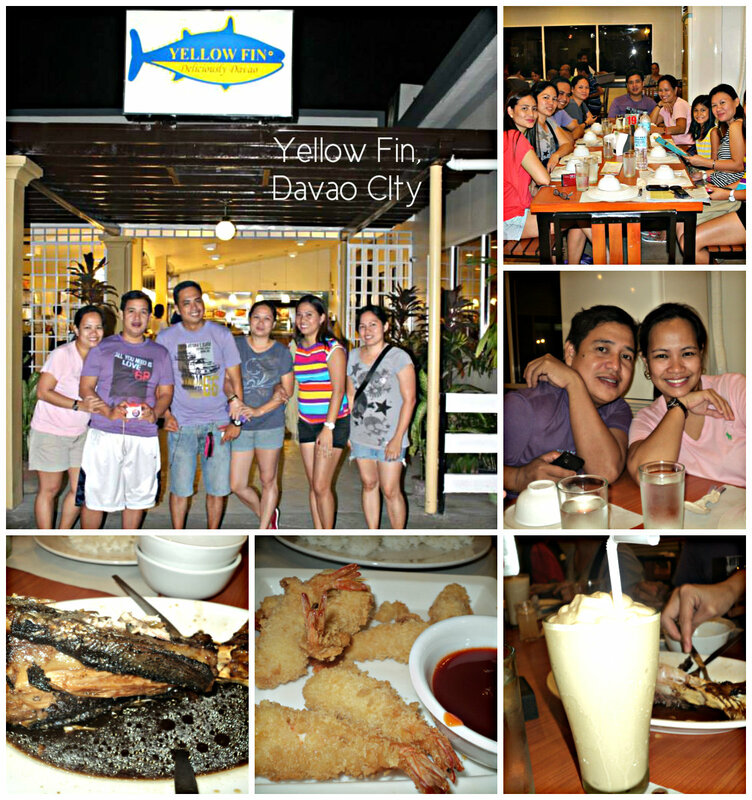 Yellow Fin was highly recommended so we decided to give it a try. 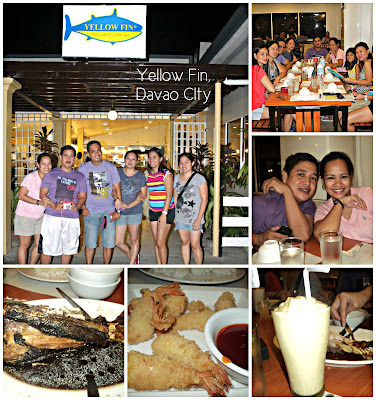 We ordered separately, and for us, we tried the Adobong Tuna Buntot which was good for 2-3 persons. And it was good! We also had tempura which was very good also! I wanted to try some of their veggies, but unfortunately, they were not available. Aside from the tuna and tempura, I cant remember what else we ordered. But we tried their Durian Shake, and it was really good. I have no sense of smell so I wasn't really bothered by the smell, which one of my friends described as amoy imburnal, hahahaha. I guess its a good thing I can't smell it? Hahahah. Anyway, if you happen to go try the Adobong Tuna Buntot, it was really really good! Next on our itinerary in Samal Island was a visit to Maxima Aquafun. After Hagimit, we had a quick lunch at one of the carinderia in the palengke and then we were off to Maxima. 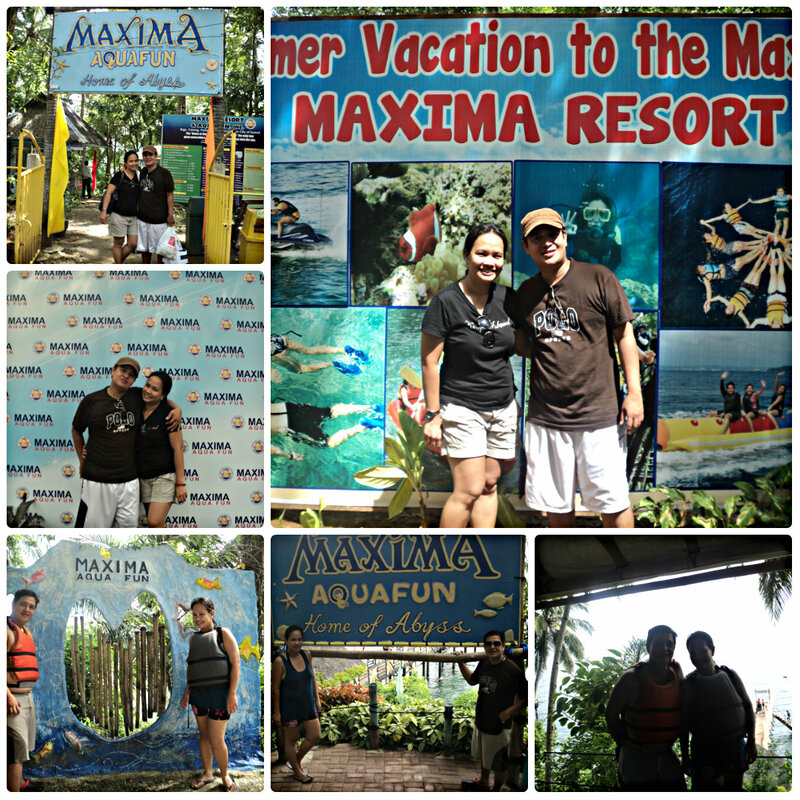 Entrance fee was P200 each, with free cottage, use of life vests and unlimited access to the giant slide. By the way, it was a long walk down to the beach from the entrance, so be prepared. I meant for going back up. Ha ha ha ha! The place was not crowded and the restrooms were adequate. Food is allowed inside but since we already had a very filling lunch, we only had our chips and drinks with us. So, off we went to the giant slide. And it was scary and fun, or fun and scary! It felt as though the slide will go on forever! 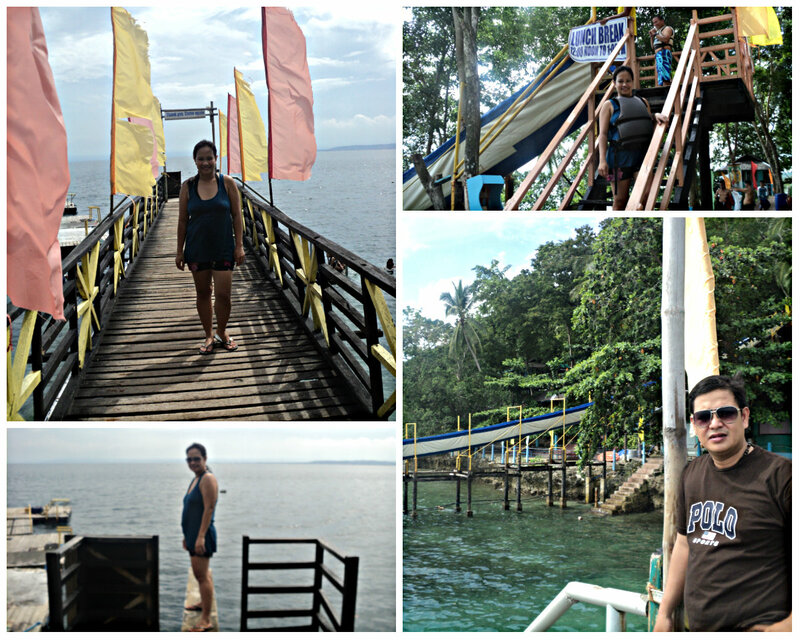 I was finished with my initial wave of screams, and I had to start again before I took a plunge to the very salty water! And I sunk deep and went up instantly, sputtering, and shouting and just happy to be alive! It was so scary and fun! I only had 2 turns on the giant slide, and the second one was just so I can have my picture taken (P75 each)! After that, we just had fun swimming, jumping on the diving platform (well, not me!I just posed for pictures) and of course, jump shots! It was another super fun day with the super friends with one even conquering his fears! 1. Drexelle's UPCAT and going to UP for the first time. 2. Finally enjoying my classes, and knowing my classmates better. 3. My husband for getting up in the morning to get the kids ready for school for 3 days in a row! 4. Paying off some of my loans. 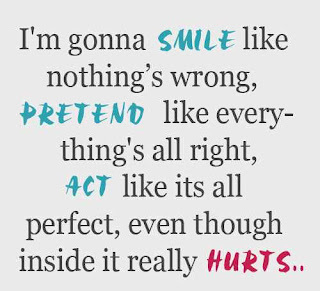 Sarap ng feeling! 5. Mountain Maid Ube Jam from Baguio. I finished a bottle in 2 sitting! 6. Facial from Slimmer's World with Vangie, thanks to gift cheques from Rachel. 7. My husband's Native Shoes, thanks to the gift cheques I won from Nuffnang. 8. Caramel sundae from McDonalds. Simple pleasure. 9. Sweet kisses from my kids. 10. The mezzanine in our house. 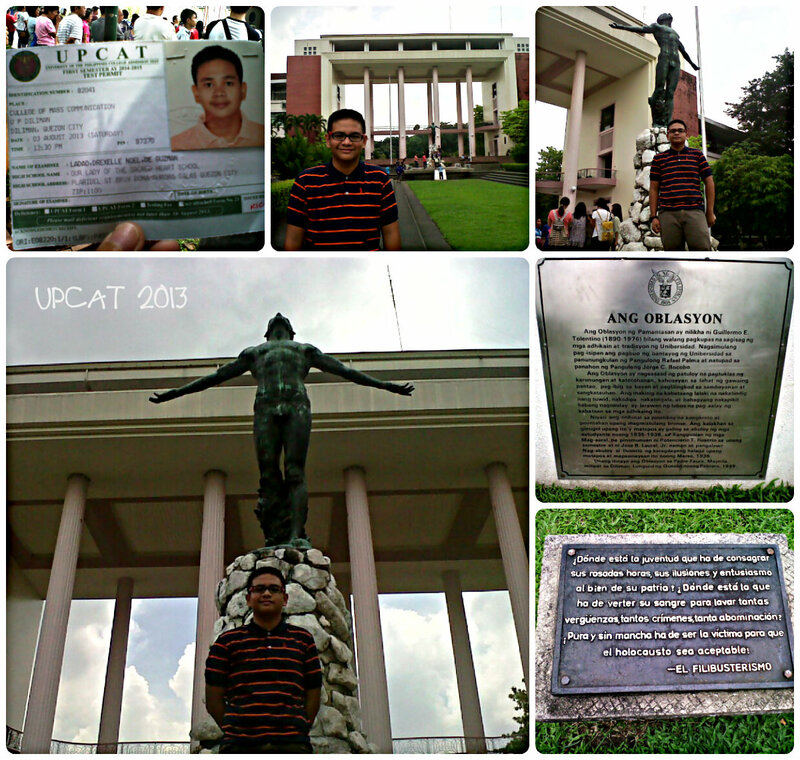 Last Saturday, my son was one of the 83,000 hopefuls who took the UPCAT for a chance to study at the country's premier university. I gave him the chance that was not given to me when it was my turn to apply for college. Truth be told, I am not that confident that he will make it, but I wanted for him to have the chance and the experience. #malaymo was our motto. Not that I don't believe in my son, but I also know that his inclinations may not always be towards getting into UP. He actually wants to study at UST but I am not sure if we can pay afford it at this time. So I told him to do his best, and #malaymo, meant to be pala! Goodluck anak! May the odds be ever in your favor! 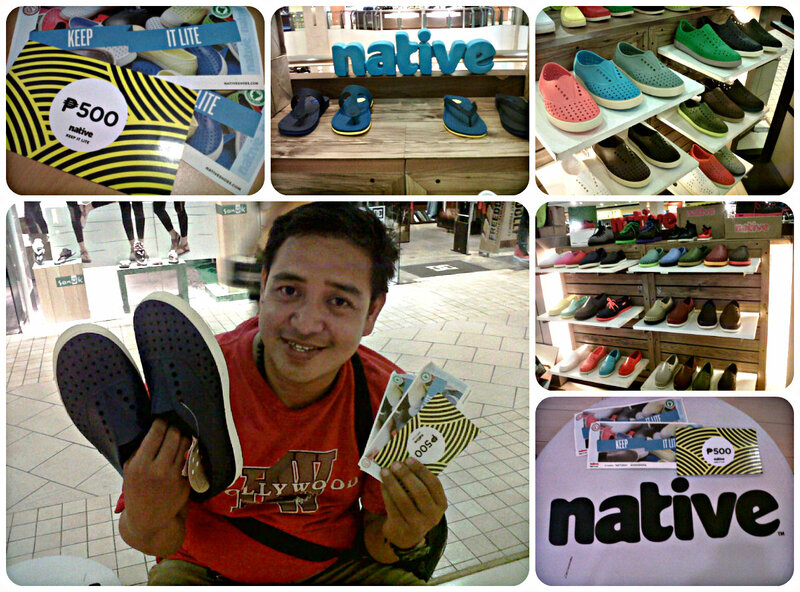 Look Who's Got New Native Shoes? I am so busy right now that I have things coming out of my ears already! 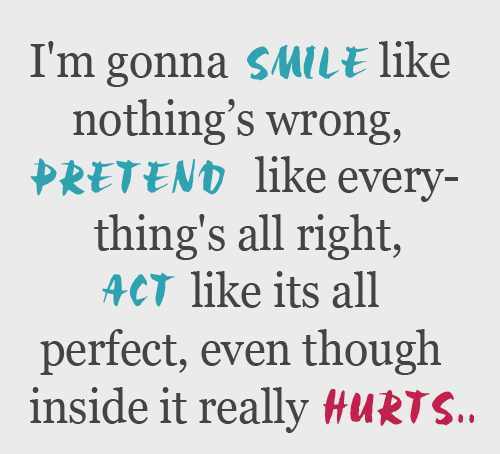 Hahahaha, kidding! But of course, I am now juggling work, motherhood and my studies, and after being out of school for more than ten years, I am just so out of practice and there are moments when I ask my self why I even thought to enroll. These times of self doubt are coming in in waves, and sometimes, I give in to them. How? I sleep. Yep. I just figured in between teaching, babysitting and all other mom-stuff, and work, I sometimes deserve a Me-time. I love sleeping and reading and when everything becomes too much, I just stop, read, and sleep. I figured everything else will be right where I left them anyway when I woke up, but I will be rested and re-charged and ready to face them again. And since I hate losing, I find ways to make things easier too by looking at Perhaps.co.za to help me look for help! Its a free ads portal so everything is just within reach. We should always remember that we are just human, and sometimes we just need to take a step back, and relax. 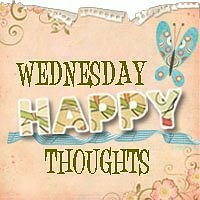 I would rather take a little breather, than face my problems when I am overwhelmed because I know that I might not always make the best decisions. So, take a little time off, and concentrate on the best thing in your life, You! I was too busy, to busy last week! 3. My sister Kris was not at home so I had to help the kids with their homework and costumes. 4. I was adding my comments on our group paper. 5. We had to go to a wake. 6. The house was a mess because we added a mezzanine. 7. I had to do the laundry and the ironing. 8. I was working on a project at work. And because it was a stressful week, I was stress eating! And this added more to my stress, hahaha. This was not as bad as before but I had no time to blog as I was too busy catching up with work and school stuff! Now I am really wondering why I bothered to enroll, hahaha. 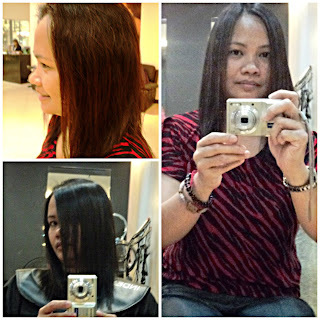 Last month, I felt my hair was too long and I already had split ends so I decided to go for a trim. The following day, my hair looks all kinds of weird! So I had no choice but look for a reasonable rebond deal. 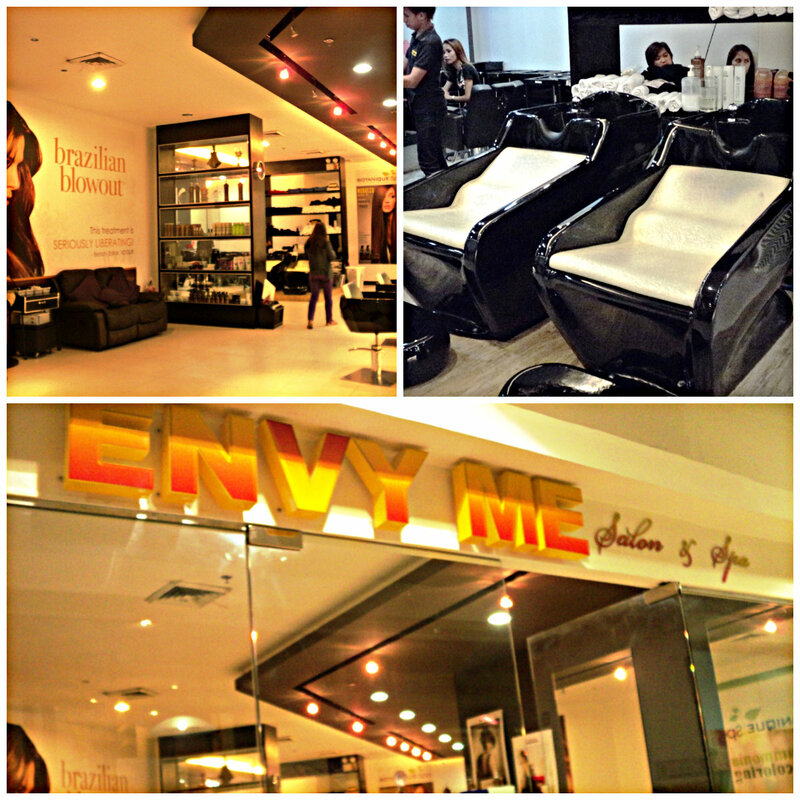 Good thing I saw that Envy Me Salon in Galleria was on sale at Metrodeal so I availed of the voucher. Availment was supposed to start on August 6, but I couldn't wait so I called to ask if I can have the treatment done the following day and they agreed! So I left from work early and was there at 4. Envy Me Salon looks very nice. It was chic, clean, and well-lighted. I approached the counter for my appointment and after I handed the voucher, I good to go. The treatment was great! 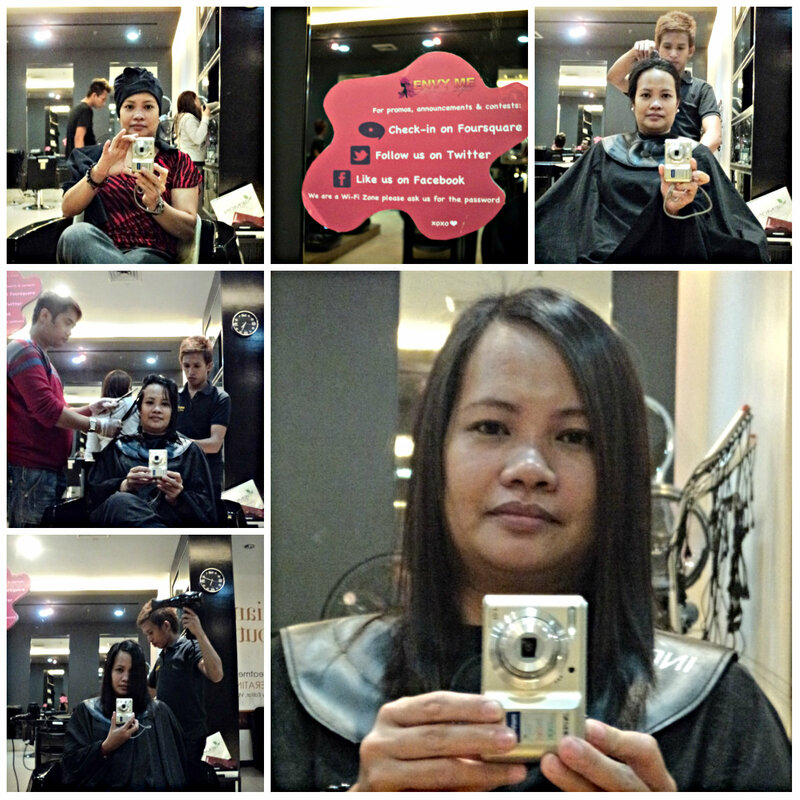 My stylist, (I forgot his name) was very serious with his work and keeps on checking that I was okay. There were several people working on me despite the presence of other customers. One girl shampooed my hair, another helped with putting on the treatment and another also helped with the blow dry and ironing. The service was great and not rushed! I loved it! And to top it all off, my hair looks great! 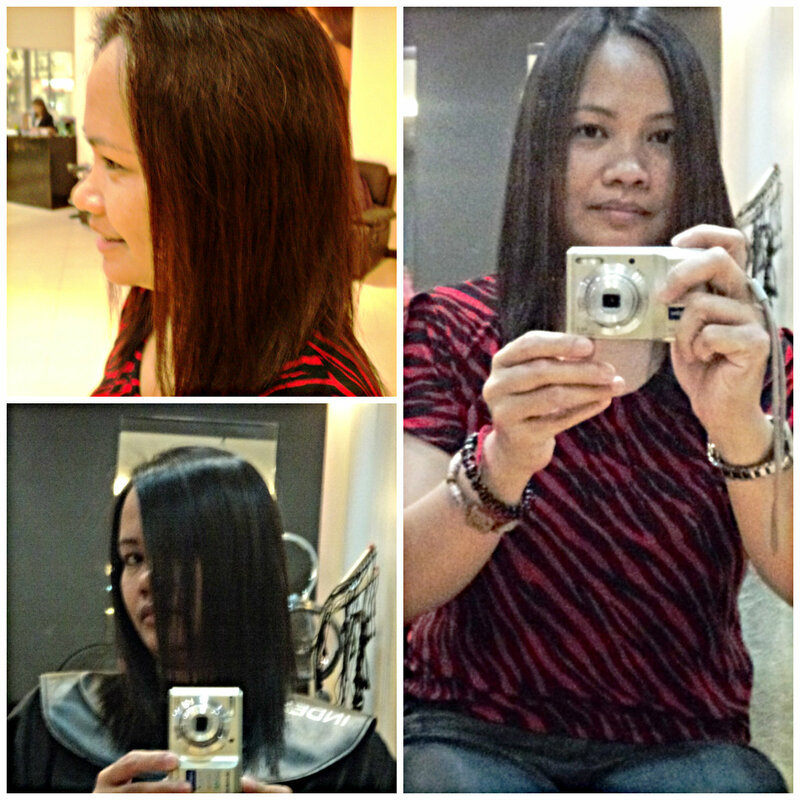 My hair has body, so unlike the usual rebond that I see where the hair looks too straight! Everyone at the office loved it. I love it! But please, excuse the double chin, hahaha!